Throughout March, we celebrated women-led brands with our Women We Love Initiative. Now, we want to turn the spotlight on the inspirational and empowering women in your own community! You know her, the one that works tirelessly but always with a smile on her face. The woman who knows how to lift you up when you’re feeling down. She’s your partner, your mother, your sister, your friend. She’s an everyday woman that inspires you, and she deserves some applause! 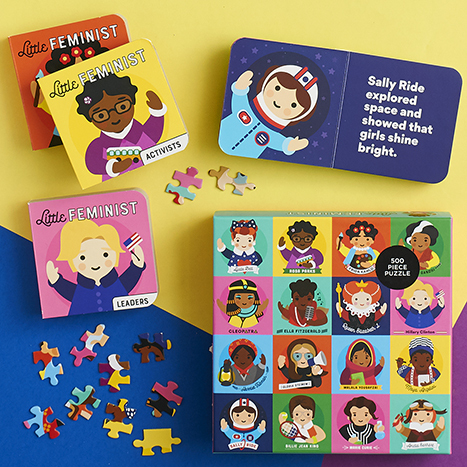 As a special way to help you honor this fierce and fearless woman, we’re giving you the chance to win an illustration of her likeness, courtesy of Lydia Ortiz, the illustrator of the Little Feminist collection. There are two ways to enter – Stop by any Paper Source store and fill out a paper nomination, or post your nomination to Instagram using the hashtag #PSCelebratesWomen. Submit your nomination by April 29th for a chance to win. We can’t wait to see all your inspirational nominees! I’d love to see more products about Women Empowerment. Oganizing my book launch party and can’t find many a good variety of items to add to the swag bag. Would love to see the collection expanded.